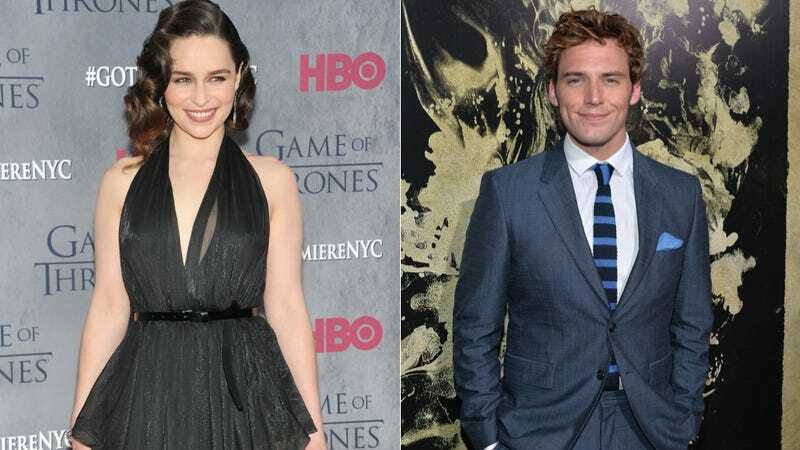 MGM has just announced that Emilia Clarke (Daenerys Targaryen on Game of Thrones) and Sam Claflin (Finnick in The Hunger Games) will play the romantic leads in the upcoming adaptation of Jojo Moyes' novel Me Before You. Me Before You tells the story of Lou, a small-town girl caught between dead-end jobs, and Will, a success all his life who finds himself wheelchair-bound after an accident. He finds no reason to live until they meet when he hires her as his caretaker for six months, and she becomes determined to prove to him life is worth living. They head for a series of adventures together, which changes each of them. The author wrote the first draft of the script, and (500) Days Of Summer scribes Scott Neustadter & Michael H. Weber did the most recent draft. The film will be the feature debut of British director Thea Sharrock who has previously focused on television — such as Call The Midwife and miniseries The Hollow Crown (starring Tom Hiddleston) — and theater, having helmed Equus (starring Daniel Radcliffe), After The Dance (which one four Olivier Awards) and many more. In 2001, at age 24, Sharrock became the youngest-ever artistic director of London's Southwark Playhouse.